12 Vital B2B e-commerce features from the B2C experience. You may already have a B2B online system or be considering one for your business. Either way, you need to know that your B2B buyers are more and more expecting a B2C experience when purchasing from you. Stay ahead of your competitors going into 2019 by incorporating these B2C aspects into your B2B e-commerce features. Now is the time to make sure you’re on track. Should B2B e-commerce features follow B2C? It’s safe to say that B2B customers (business buyers) are very different from B2C (individual) customers, and that the e-commerce platforms they use should reflect that. They purchase for radically different reasons and each want to do business in specific ways. Let’s start by looking at how they differ. Interested in special deals and coupons Researches the best deal based on reliability, price and quality. Interested in sustainability of relationship. It’s also true that B2B customers are people too and they have probably made use of B2C platforms like Amazon. They’ve got used to certain features, practices and standards, and they expect something similar from their B2B experience. Also, their demographic is changing as more and more millennials become buyers. At Comalytics, we believe your B2B system needs to cater specifically for the business buyer’s need, while also providing helpful (and expected) “bells and whistles” from the B2C experience. Your B2B e-commerce system should include a much broader range of features than we can cover in this blog. Please read our B2B Features page should you want to understand the broader context. 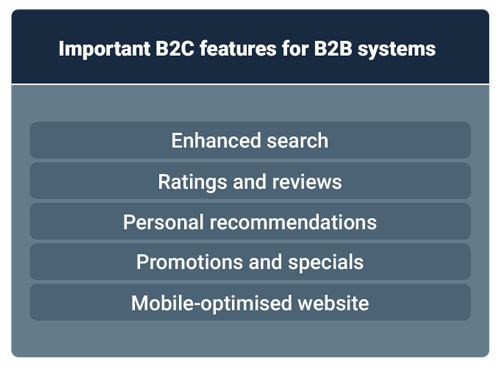 For our purposes here though, let’s look at the B2C features that have become must-haves for your B2B e-commerce system. Excellent product images and very detailed product descriptions are a minimum requirement on B2B sites today. It’s a proven fact that beautiful images and useful, clear product descriptions increase your sales, both for B2C and now also for B2B. It also drives customer self-service, minimizing the time and pressure on your team to answer product queries. Traditionally, B2B customers simply bought the products they needed and knew you stocked. Now they want to search your online catalogue for other products that they can buy from you in one convenient purchase. Having beautiful, descriptive product data will enhance their buying process and drive conversion. Moreover, ensure you clearly display related products (cross sells and up-sells) during their buying journey. When you provide useful information that helps customers solve their problems, without trying to sell to them, you add value and build trust. Consider incorporating technical specifications or manuals on your product pages. Offer “supplier agnostic” blogs where your main focus is to help your customer understand why and how to use products – not to sell your brand or your specific product. Today’s audience responds powerfully to videos. Consider creating both high-level videos that give an overview of what you have to offer, and more specifically targeted ‘how to’ videos that show your products in action. And as you build this wealth of helpful content , you are also creating a treasure chest of marketing material you can use to attract new buyers to your site. This type of marketing, called inbound marketing, is the way of the future. Rather than pushing unwanted ads into the life of a customer, you instead attract them voluntarily into your business by offering (supplier agnostic) solutions to their problems. With the introduction of your online catalogue, B2B buyers now have the freedom to browse a bit more. In the process, they may well want to search for items they are currently buying elsewhere and compare your prices and terms. It’s therefore important to make products very easy to find on your site, no matter how many items you sell. Place multiple search bars prominently on your site. Allow search on key information, such as part names, numbers, product type, product details and brands. Also allow search on information not visible to the customer. For example, perhaps shock absorber SKU 123’s number recently changed to SKU 456. If the customer is still searching on 123, they should be able to find it. The same applies to allowing search on competitor, supplier or customer SKUs. These may not be displayed on your e-commerce site, but your customers may be in the habit of using them. Provide filtered facets and/or drop-down categories to easily drill down to the correct product. Offer ranking options such as price, most popular products or current promotions. Online reviews dramatically impact your bottom line. They are easy to implement and they build trust in your brand. As a result, conversion rates improve, sales are reported to increase by an average of 18%, and customers keep coming back. Ratings and reviews also improve your search engine ranking so new potential customers can find you. Read how online reviews can impact your business. Running a responsive site is now a no-brainer. And with so many people using alternative devices to shop online, your mobile-optimised site needs to cover all phases of the sales cycle. Also consider an offline mobile app that allows customers or reps to place orders on any device when they are not connected to the internet, making service that much more accessible. Transparent customer-specific prices and stock levels ensure that your B2B customers become self-sufficient. Integrate your B2B site with your ERP, and you can display customer- and other rule-based specific prices with little effort. When you show your customers they can rely on the information they find on your site, you build trust and credibility. Your B2B e-commerce site should be clearly set up for customer-specific rules and deals. When a customer enters a specific quantity, any discount that applies (according to your agreement with that customer) should automatically be triggered and displayed. This is the equivalent of discounts or freebies over a certain threshold for B2C, except here it’s built into your system per customer. As with the B2C market, it’s a driver for increasing Average Order Value (AOV). If you also integrate with a marketing automation system, you can communicate interesting, strategically-planned deals and promotions to your customers, specifically tailored to their buying behaviour. B2B customers expect clearly explained shipping and payment options that make it easy for them to choose what suits them best. Understand your customers’ needs and provide them with flexible options that work both for them and for your business. Read more about shipping strategies and payment methods here. Most importantly, remember to be upfront and transparent with your customer. Don’t present them with surprises at checkout. Taking accountability for your shipping information helps your customers deliver to their customers in turn. Choose your shipping options well, and let your customers know exactly where an order is in the process and when they can expect to receive it. A shipping integration, like Smartfreight, makes this easy if you do not have in-house logistics capability. And if a delay is inevitable, break the bad news as soon as you know about it. Once again, trust and transparency are key. Today’s B2B buyers have become far more pro-active than before and want you to care enough not to dictate how they should communicate. Most importantly, they want consistent service. They also want excellent service using multiple channels like their B2C counterparts. Channels may include: face to face, conventional telephone, mobile phone, social media, online forums, apps and live chat. Live chat, linked to your B2B e-commerce store as a feature, will help you go a far way in onboarding your customers successfully to the new sytem, but also supporting customers that have questions or concerns – freeing up your sales reps to do growth work with your customers. Conversion rate optimisation (CRO), originally only applicable to B2C, measures your success rate in persuading visitors to your site to do what you want them to do. This may be to take actions like ‘registering’, signing up for a newsletter, buying something or buying above a certain value. To achieve this for your B2B site, aim to reduce obstacles by making everything as simple as possible for the customer, from the information on your site to the process the customer follows to check out. a way to draw in new customers. How you use social media depends totally on the type of business you have and the phase of maturity you are in. The most important thing to remember with social media though is to aim to build personal relationships. Treat your clients as valued friends and/or business partners. Ask questions, offer assistance, share insights, expertise and personal experiences, and generally show an interest in your customers’ lives. When you want your business to thrive, staying on top of the game is critical. There are plenty of competitors out there who won’t hesitate to take advantage if you fall behind the curve. Make sure your business is ready for the upcoming season now and you’ll be set for success.